While both convenient and inexpensive, electroshock convulsions can be complicated because they are expressed in a variety of forms that are dependent on the rodent strain, the strength of the electrical current used, and the placement of the stimulating electrodes. 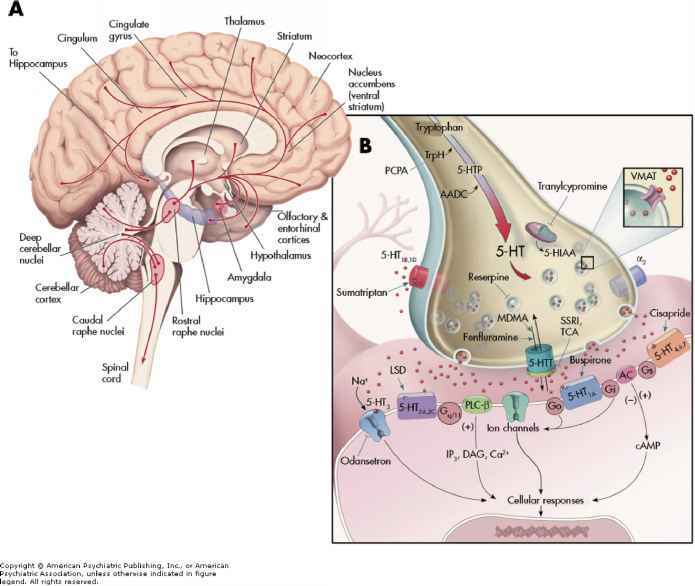 The chapter sections following the itemization provide a more in-depth consideration of the specific details of electroshock techniques, including the rationale for commonly used procedures, electrode placement, electrical current-related variations in the convulsive response, interpretation of the results, and other factors that influence the convulsive response. Electroshock is best performed by a single person. Reproducible results are most reliably achieved if a single investigator holds the animal, applies the shock, and measures the duration of the convulsive phases. With practice, consistent results can be readily obtained. Prior training in rodent handling skills will assure proper and humane treatment of the animals. It is highly recommended that a leather gardening glove be worn on the hand that restrains the animal during the administration of the electroshock current. Some animals struggle while being restrained for the electroshock and may bite. After the electroshock-induced convulsion, rats often exhibit an exaggerated startle response and may bite aggressively. A leather glove is especially important in handling a rat in the first 5 to 10 min after an electroshock-induced convulsion. The electroshock procedure described involves the use of a Wahlquist stimulator designed specifically for electroshock. Although no longer available, many departments of pharmacology still retain Wahlquist stimulators in storage. Alternative sources for commercial electroshock stimulators are discussed later in the chapter. 1. Place the electroshock stimulator on a nonconducting table or counter top. Clear a 4 to 5 ft2 space in front of the stimulator for handling the animal. The stimulus initiation switch is usually a foot pedal that is placed on the floor directly underneath the cleared workspace. The stimulator is activated by stepping down on the pedal and releasing it. The stimulus is induced when the pedal is released, thereby eliminating the need to "hunt" for the pedal while restraining the animal. 2. Remove the animal from the cage and place it on the cleared area. Using the gloved, nondominant hand, restrain the animal by cupping the palm of the hand over the animal's back with the middle and index fingers on each side of the neck (Figure 1.1). Panel A depicts an artist's conception of the handling technique for administering corneal electroshock. The animal is restrained by cupping the palm of the nondominate hand over the back of the animal and placing the middle and index fingers on each side of the neck. 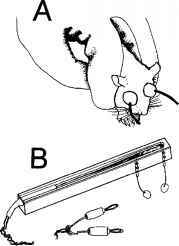 Mice may be held in the position shown to apply the drops of 0.5% tetracaine to the eyes. As illustrated, the saline-soaked, cotton-covered corneal electrodes are placed directly over the eyes. The electrodes must be held firmly in place for the entire duration of the stimulus (usually 0.2 s) to ensure that the intended stimulation is delivered. The technique may be used in rats or mice. It is recommended that a leather gardening glove be worn on the hand that restrains the animal. Panel B depicts the electroshock stimulus delivery handle as manufactured by Wahlquist, Inc. As illustrated, the handle is constructed of clear, nonconducting acrylic, through which the components are clearly visible. The electrodes are attached by connectors mounted in the acrylic. The stimulus conducting wires proceed internally through a channel in the handle. A cover is permanently fixed over the channel to internalize the conducting wires. The stimulus conducting wires are interfaced with the stimulator using standard banana plugs. to facilitate electrical conductivity. The electrodes should have been previously adjusted to fit snugly over the eyes. The electrodes are held firmly against the animal throughout the stimulus to ensure constant contact. 5. Pass a 60 Hz, 0.2 msec electrical current of variable amplitude (18 to 500 mA in rats as discussed below) through the electrodes. The electrodes must be held to the animal's eyes for the entire duration of the stimulus to prevent arcing. Arcing is the spark resulting from the electrical current passing through the air between the electrode and the animal. When an arc or spark occurs the animal may not have received the intended electrical stimulus. The strength and duration of the stimulating current may vary according to the desired response and can be set by the controls on the stimulator. The convulsive responses evoked by the various electrical stimulation currents are described in Table 1.1. 6. Just after the stimulus, quickly roll the animal onto its side with the feet toward the investigator so that the evoked convulsion may be observed in its entirety (Figure 1.2). The convulsive phases are described in detail below.